While awaiting her unjust execution at the hands of the treacherous Queen Elizabeth I, the tragic Mary Stuart reflects at the series of cruel political machinations that set up her path to the scaffold. Mary Queen of Scots: They can take my crown. But not my right. 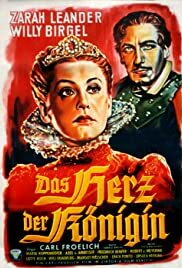 A beautiful and moving film with some sequences of song and dumb-show leaving the spectator spellbound...a mix of the German sense of poetry and doom and of something almost like Bergman's Seventh Seal. Fine black and white photography, proper attention paid to every detail. Minor parts are all remarkable and even Birgel's swagger and Lotte Koch's half-dazed performance are intriguing. Zarah Leander at her best!